I’ve realized that I’ve been slacking in the kitchen and haven’t posted any tasty recipes in a month! Probably because the majority of my easy “go-to” recipes have already been blogged about, and I’ve been too busy to cook anything more than a quick fix. But last night I decided to get back in the swing of things and whip up something healthy and delicious that I haven’t cooked in a while. 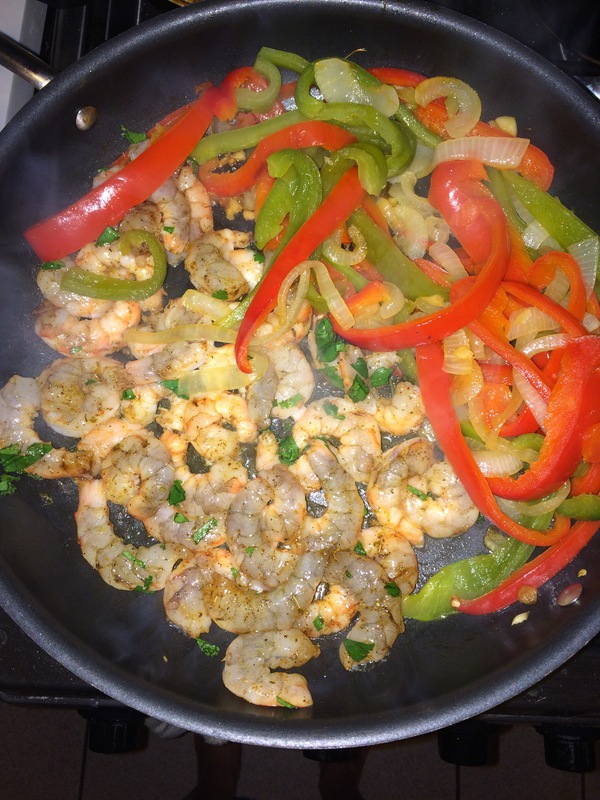 And after cooking these Shrimp Fajitas I wondered why I don’t cook them more often…. They’re packed with Mexican heat and flavor, are low in fat, take almost no time at all, and require only a few ingredients. This will certainly be a weeknight staple from now on. After a week in Paris the bf and I were both craving something “south of the border” since French food is pretty much opposite of that. Matt suggested tacos, but when I make tacos I want to go all out and have some kind of slaw or interesting topping to spruce them up. Last night I wanted to use mostly ingredients we already had, so I settled on fajitas! 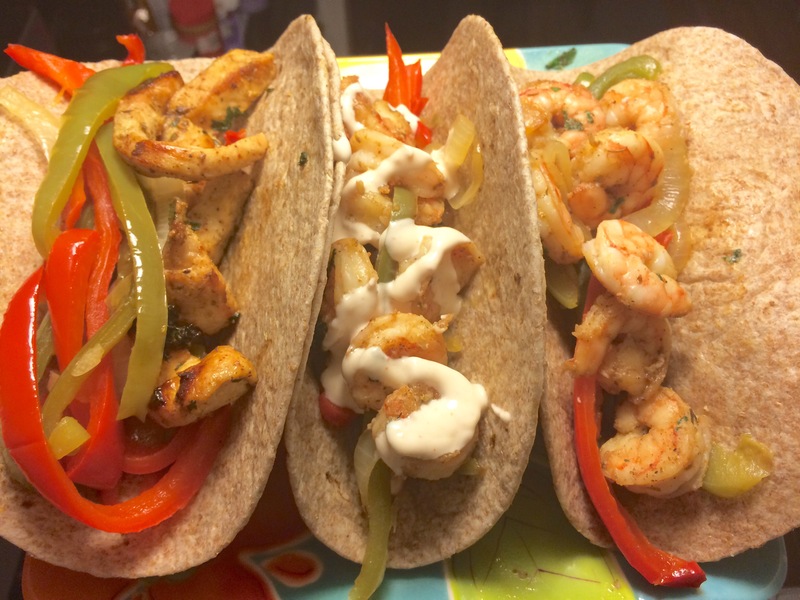 Because the main ingredients in fajitas are just peppers, onions, tortillas, and whatever meat you choose! Voilà! So simple. I don’t think I had made fajitas “per-say” before, but again it’s such a simple dish I didn’t think I could really go wrong! Sticking to a fundamental Mexican spice combo will never, ever hurt. And just as I predicted, they were fabulous! The shrimp were so flavorful and tender, and the peppers and onions had a nice char and smoky flavor. I wanted to splurge and top it with a made-over sriracha sour cream, which added a nice heat and creaminess. And of course, to make it “healthier” I put it in a whole wheat tortilla instead of flour or corn. Although I prefer flour tortillas for Mexican dishes, the juiciness from everything made me not even miss it. Matt and I gobbled them down and were pleasantly full afterwards. Success! In a small bowl combine the shrimp with 1 Tbsp olive oil, cilantro, and spices. Set aside. In a large sautee pan, heat 1 Tbsp of oil over high heat. When hot, add in the peppers and onions. Sautee until they begin to char and soften, about 5-7 minutes. Add in the garlic and reduce heat to medium, and cover. Continue cooking until the peppers reach their desired doneness. They should be soft and the onions should be almost caramelized. At this point, move the vegetables to the edge of the sautee pan so they are not above the direct flame, and turn the heat up slightly to medium-high. In the center of the pan add in the shrimp in an even layer and let sit for about three minutes, then flip. Continue cooking the shrimp until they are pink and opaque throughout. Combine the shrimp and peppers together and remove from heat. In a small dish stir together the sour cream, lime juice, and sriracha, if desired. Warm the tortillas according to package instruction, and fill with the shrimp and veggies. Drizzle with sriracha sour cream and serve.